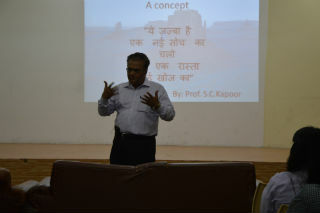 JIMS organized a workshop on “ Working in Teams for Success” for BBA-III Sem students on 23rd September, 2016 by Prof. S.C.Kapoor. Later, the working of a human mind was targeted and the students were delineated how each member thinks in a team and how a leader should bring out the best out of each member individually. As the event moved forward efficient communication was explained with the help of a beautiful activity where 2 teams with 2 members each were formed. 1 student from each team was blind folded and the task of other student was to instruct him so that he can safely reach the other side without hitting any object. All these activities were relished by all the students as majority of students participated atleast in one activity. Completing with all the activities, an inspirational video was played in which leadership & teamwork was focused. 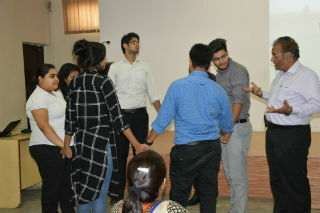 The workshop helped the students to understand the significance of teamwork & leadership.